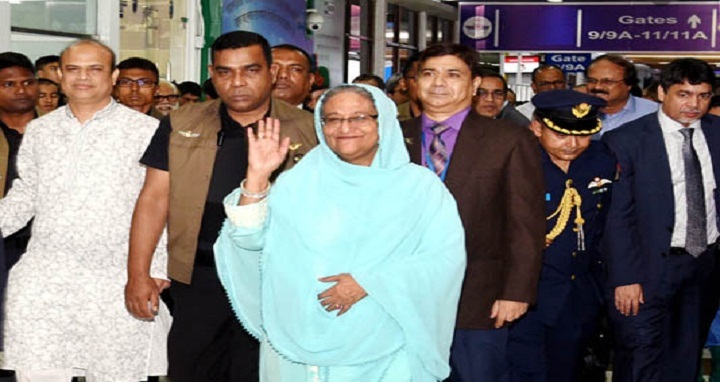 Dhaka, 20 October, Abnews: Prime Minister Sheikh Hasina returned home in the early hours of today concluding her four-day official visit to Saudi Arabia at the invitation of King and Custodian of two Holy Mosques Salman bin Abdulaziz Al Saud. A Biman Bangladesh Airlines VVIP flight carrying the Premier and her entourage members landed at Hazrat Shahjalal International Airport here at 1.25 am. During the visit to Saudi Arabia, the Prime Minister had an audience with the Saudi King at Royal Palace in Riyadh and joined a lunch hosted by the King in her honour. The Premier inaugurated Bangladesh Chancery Building in the Diplomatic Quarters in Riyadh and laid the foundation stone of the Chancery Building of Bangladesh Consulate General in Jeddah.